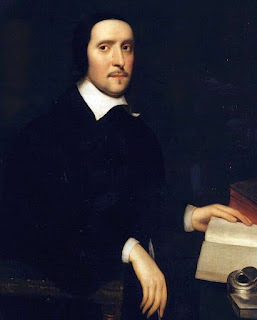 Following some appreciative emails in response to the quote from Jeremy Taylor posted yesterday, I want to share with those readers who know the good bishop only for his devotional writings the fact that he produced a revision of church services, including an order for Holy Communion ("An Office or Order for the Administration of the Holy Sacrament of the Lord’s Supper According to the Way of the Apostolical Churches, and the Doctrine of the Church of England"). This he did for the use of those to whom he ministered under great difficulty when the Book of Common Prayer was banned during the Commonwealth. The order for the Eucharist draws heavily on Scripture and the Church’s early liturgies, and demonstrates the Patristic theology of the Caroline Divines, with its focus on the High Priestly ministry of Jesus. Below is the Eucharistic Prayer. Go HERE for the full rite. and wonder, and love and worship Jesus. of holiness and life Eternal, through Jesus Christ our Lord. holy and merciful to the work of thine own hands. Take, eat, this is my Body which is broken for you. we shall shew forth the Lord’s death till he come. how shalt not thou with him give us all things else? Blessed be the name of our God for ever and ever. Amen. do dwell for ever and ever. Amen. and pray thee for ever to continue thy goodness towards us.